Sandrine is a French national qualified in different fitness techniques and has been traveling around the world offering fitness classes and training sessions to many fitness enthusiasts for over 25 years. Next session tomorrow morning at 08H00 at the water's edge! Hope to see you there! 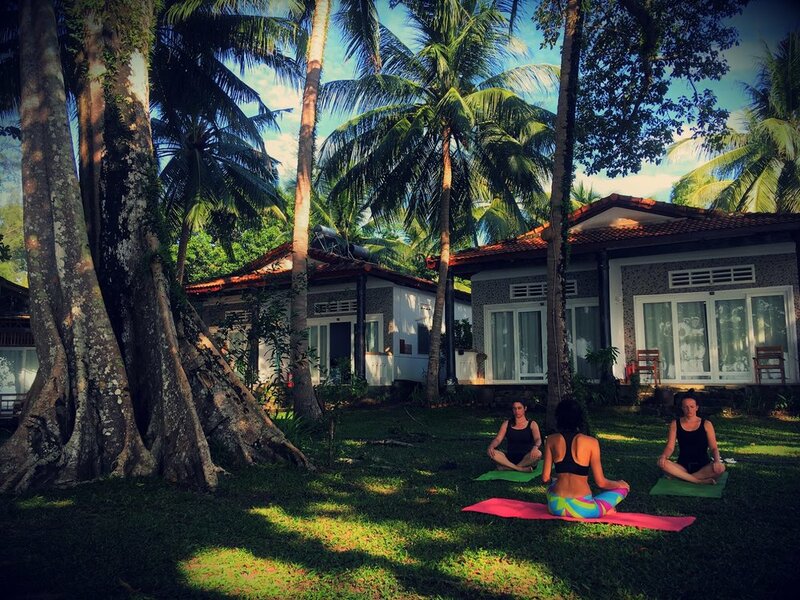 Lola and Bamboo Cottages have joined hands to offer a series of 7-day retreats in March and April which combine the ancient and contemporary practices of Yoga, Positive Psychology, Mindfulness, Metta (Loving-Kindness) Meditation, Art Therapy and Dance. Lola will design a HAPPINESS PROGRAM based on your experience and needs to explore what makes you truly happy and learn how to create more space for joy, positive emotions and meaningful relationships in your life. For more information on dates, prices and content of the workshops, click HERE and/or email us at bamboophuquoc@gmail.com. Now that the rains are visiting us with less frequency we are now offering free yoga class again everyday on the beach to guests staying with us. Classes include gentle traditional Hatha Yoga, for strengthening and lengthening the body, as well as flowy energizing Vinyasa yoga with lots of power and activity, and therapeutic Yin-yoga with relaxing and balancing positions to calm the mind and soul. One hour classes are offered free of charge for guests of Bamboo Cottages everyday. Those not staying with us are also welcome to join for 100,000 VND per class. Simply call to inform us you're coming in advance please. Our teachers come from around the world on a rotating basis and are trained and certified, and are always eager to introduce yoga to beginners or to help deepen the practice of more seasoned yogis. In yoga we learn to listen to our bodies, and ourselves. We invite you to join us on a yoga mat, under the banyan tree, with no judgement or expectations, where all that is needed is for you to simply be in the present moment. We are so proud to have been in included in Guide de voyage Vietnam: Guide Tao écolo et éthique, a well curated French travel guide for those who want to travel consciously. This book is available in paperback or digitally. We think this book is a great companion for the engaged and ethical traveler. Dans l’esprit du Tao, ce guide se veut un outil de promotion des initiatives pour un tourisme durable, mais aussi un moyen de découvrir le dragon de l'Asie et ses habitants, à travers des adresses plus intimistes, des étapes méconnues ou encore des itinéraires secrets. Miho is the creator of the popular and spirited travel and food blog Wander to Wonder and she and her husband recently stayed with us for two days during their "Year of Mindful Living". Miho documented everything, with her great writing style and candid photos of our food, beach, room, puppies -- everything. See all of her pictures and read her post about Bamboo Cottages. We loved having you Miho, come see us again anytime! Here's an excerpt: "When we were planning our trip, we knew that we wanted to go somewhere by the beach for a couple of days to relax and basically do nothing. After much research, we decided on Phu Quoc Island, ... and we found a little gem of a hotel - Bamboo Cottages. Not only did it sound like exactly the kind of hotel we love (family run, non-corporate, small, boutique), it also fit in perfectly with my Year of Mindful Living. Bamboo Cottages is 100% solar powered, an independent business run by an American/Vietnamese family, and through being completely "off the grid", they minimise costs to help donate some of their proceeds to educational scholarships for local children. I fell in love with their ethos (and the beautiful pictures of their private beach didn't hurt either! ), and we headed there for 2 nights of blissful peace, fresh air and the salty sea." "It goes without saying that E and I have high expectations when it comes to food, so although we were half reassured by the raving reviews of the food at Bamboo Cottages, we were still crossing our fingers that it would be as good as we'd read. … Well, I honestly cannot tell you how wonderful the food was... Considering they only have one large fridge due to the solar powered electricity, they have a large enough menu to offer variety for at least a long few days, and we actually ordered the same things a few times as they were just so good! You could tell that everything was made with such care and pride, served beautifully, and for European standards, everything was extremely affordable (it probably cost us about 10 pounds each per day, for lunch, dinner and drinks). We had their summer rolls (probably our favourite that we tried in Vietnam!) basically every meal, their homemade sweet potato crisps were amazing, the fish clay pot was superb and neither of us could fault a single thing we ate there." "I have the impression that we do all what we can to get away from what is really meaningful to ourselves, always busy doing as many projects as we can, being stressful about so many different things: deadlines, performance, efficiencies etc…, and living in an artificial environment lacking of beauty and harmony with Nature. We assume that this is how things have to be, so that we sometimes don’t even know what we are missing. When our daily life is disconnected from Nature, we are also disconnected from the Abundance and Harmony that Nature always offers." "Nature in every moment is the manifestation of supreme harmony, an inter-being of everything into a perfect circle of life. By living closely to Nature, our senses for harmony and beauty will be consistently nourished in the highest and purest way." We couldn't agree with her more. Enjoy Phuc's entire photo essay (in Vietnamese & English), "Creating the Extra in the Ordinary", here. Take a moment to read the intrepid Mark Bowyer's piece on Bamboo Cottages in his excellent online magazine Rusty Compass, and learn a little about the changes that are taking place on the island of Phu Quoc. Thanks for stopping by to see us, Mark, and for your kind words and thoughtful reporting. Check out Vietnam's first solar powered resort - Bamboo Cottages on Phu Quoc Island. Yesterday I posted a photo feature (see the homepage) expressing my delight after checking out Vietnam’s first solar powered resort, which is located on Phu Quoc Island. There was quite a bit of interest in the piece, so I thought I should post some more images of Bamboo Cottages on Vung Bau beach. It’s a simple little place but being Vietnam’s first solar powered resort is a giant accomplishment. The Vietnamese American family that owns the 19 room resort can be very proud. The renewable revolution is upon us, as solar panel and battery prices continue to fall. The economics of solar is becoming increasingly compelling. Let’s hope some of Vietnam’s other “eco” resorts follow suit and raise Vietnam’s eco tourism standards. Bamboo Cottages is not just the country’s first and only solar powered resort, it’s a delightful little low impact place to stay too. So if you like your resorts mellow and simple, with beautiful views, wonderful green grounds and friendly staff, check it out. All is not well on Vung Bau beach though. A few hundred meters from Vietnam’s first solar powered resort, is the other face of Vietnam tourism - the port supporting the mega Vinpearl project that is engulfing the north western end of Phu Quoc. Vinpearl’s projects could never been described as low impact. And I couldn’t find any environmental information or undertakings on the resort description. All the small operators I spoke to on Phu Quoc, are concerned about the direction the island is heading in. Officials seem to be more interested in casinos, golf courses and mega resorts than in protecting and cultivating a beautiful environmental asset. Casinos and golf courses attract tourists and big money. And they drive away other lucrative tourist markets too. I think Vietnam’s pressed the golf and gambling button enough for now. Might be time to put some thought into the billions of dollars spent by tourists with environmental and heritage interests - once natural strengths of destination Vietnam. Congratulations Bamboo Cottages. May this be the start of something beautiful. After many years of adjusting our habits to conserve as much fuel as possible, we’ve come to find that less is more and “living within our means” energy-wise is actually a pleasure. We hope you will agree. Please join us in proving through experience, that living richly does not mean living wastefully. In order to be 100% solar, our guests help by being mindful of their electricity use. We ask guests not to use hairdryers, to remember to charge their phones during the day, to graciously accept when the electricity goes off in the middle of the night (this happened once; we think there was an accidental hairdryer involved), etc… There is a risk that the financial/time/effort investment we made won’t “pay off”. (Endearingly, even the solar company who we bought the system from advised us to think twice.). But we are betting that our guests won’t mind the small “inconveniences”, and rather, you will enjoy living in better harmony with nature, in tune with the sun’s generosity and with deeper appreciation of both the simple pleasures and hi-tech innovations that make life connected, rich, humane, and less-short. (Seneca said it best, Life is long if you know how to use it.) We are betting that you will relish the opportunity to join hands with us to bring business, pleasure, and ecology into more harmonious alignment. Together we can create the more beautiful world our hearts know is possible, and inspire others on the island— and beyond— to do the same! We have started home brewing our own Kombucha, the champagne of tea!! Kombucha is a delicious, lightly effervescent fermented drink of sweetened black and/or green tea. It is produced by fermenting the tea using a symbiotic colony of bacteria and yeast, or “SCOBY”, and has a similar health benefit to other probiotic foods, like yogurt and kefir. For more information about the health benefits of Kombucha, here is a good article: from Wellness Mama. Kombucha has only recently become a trendy health beverage in the West, however, it has been enjoyed in Asia for thousands of years. As reported in the Association for Asian Research, “[a] cording to traditional Chinese medicine, kombucha tea was referred to as the Tea of Immortality and the elixir of life,” writes Ed Kasper, a California licensed acupuncturist, medicinal herbalist, and a master kombucha brewer. In fact, the term kombucha is derived from the Japanese word “kombu”, which refers to fermented kelp tea. Come join us for a glass! We are inventing new “flavors” all the time; our most popular right now: Passionfruit infused Chia Seed Kombucha on ice! Here’s to feeling happy, healthy, and energized!